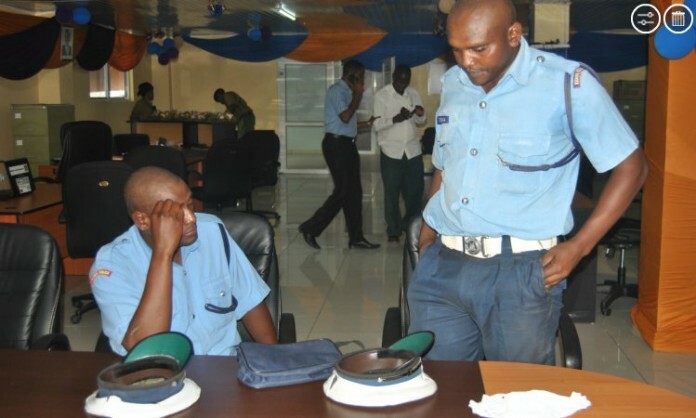 Wednesday April 17, 2019-4 police officers who have been harassing residents in Nairobi's CBD have been detained for three days for investigations. The four, a prison warder and three police officers attached to Kamukunji police station have been robbing Nairobi residents in broad daylight and they were arrested by flying Squad officers on Monday. The four are Joseph Dida Gumi, Oliver Tambo Mayavi, Kevin Adanje and Duncan Wasike. The four will be charged with robbery with violence and also stealing from Nairobians. Kibue also said they need time to for an identification parade. The police said the men are dangerous and a flight risk and if released before completion of investigations. Abdi of Makupa police Mombasa with his scared hand is always robbing motorist psv and personal cars along Kenyatta Avenue. He takes not less than 2000.